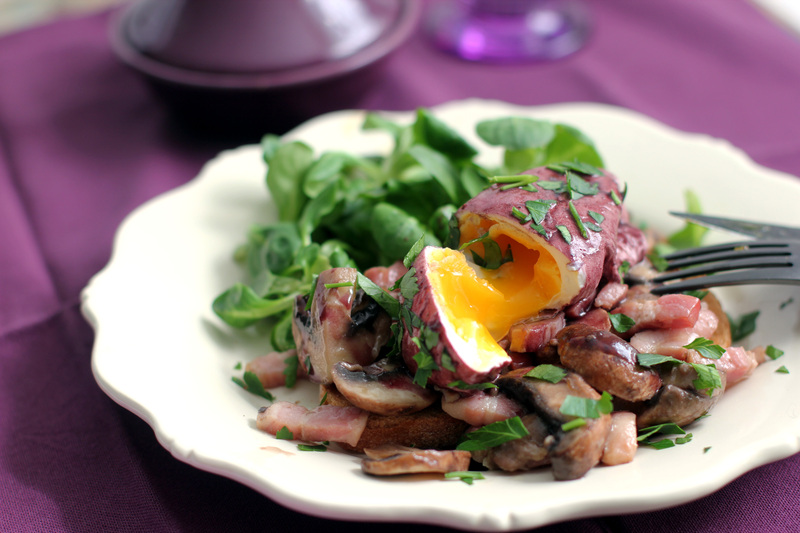 Wine poached eggs in a nest of mushrooms and bacon on toast. De-ca-dent, Frugal, de-ca-dent 🙂 I admit, I almost balked at the full two bottles of red wine needed for this recipe. Unfortunately, I didn’t have any vin de table in the house and couldn’t be bothered to go out for something “ordinaire”, so I used fairly decent wine, not an important vintage, but fairly decent. If you make this, I recommend that you buy “vrac”, something like Gallo Mountain Burgundy or Almaden Merlot in a jug or carton. Think quantity. A bottle of wine is 75cl. I’m thinking brunch with Champagne apertifs and a mixed berry/melon salad. Blanch the bacon for 1 minute in boiling water. Remove and drain. Saute the bacon and mushrooms together in a pan with the knob of butter for about 3 minutes. Set aside and keep warm. Pour one bottle(75 cl) red wine in a sauce pan, boil and reduce for about 15 minutes. Pour in the broth and continue to cook for another 5 minutes. Add salt, pepper and the sugar. Mash the flour and soft butter together and add to the wine sauce, stirring constantly until thickened. Set aside and keep warm. Pour the second bottle of wine into a big pot with the vinegar and water. Bring to a boil, then reduce to simmer. Poach the eggs, 4 at a time, in the wine. Drain on paper towels. Mound the mushrooms and bacon on the toast, top with the poached eggs, drizzle with wine sauce and sprinkle with parsley. This entry was posted in Cooking, Food and Wine, French, Main dishes, Recipes and tagged bacon, brunch, burgundy, cooking, Eggs, food, French, mushrooms, recipes, wine. Bookmark the permalink. This post made me hungry for eggs at bedtime. Thanks (I think). Hopefully, I’ll be able to hold out for a few hours! I think i’d struggle using the 2 bottles of decent wine though i’m afraid, I couldn’t bear not to drink it. The three colours of the egg are so striking. How many people would this serve, 12? Thank you Marcus. 12 or 6 hearty eaters. Looking forward to reading more and glad to be connected! Sens, is this a traditional dish to poach the eggs in wine? It looks fantastic! Yes! It is fantastic. I’m definitely doing a brunch. Wine poached eggs, delish! Wine in food early in the day screams weekend! Wow, I have never heard of poaching an egg this way! This technique opens up a whole new world! Imagine the different flavors available! Very nice shots. Any idea on the etymology of “meurette”? I don’t Jon, other than knowing that anything “en meurette” refers to an accompanying red wine sauce. I’ll see what I can find on the internet. Its seems that meurette comes from the word muire which can mean salted water. Here’s my guess: In France eggs were poached in salted water and in Burgundy, some creative cook with a lot of wine decided to enrich this simple dish by both poaching in red wine and serving with a red wine sauce? Voila! Seemed a plebeian enough task, almost like blurting out a blurb. 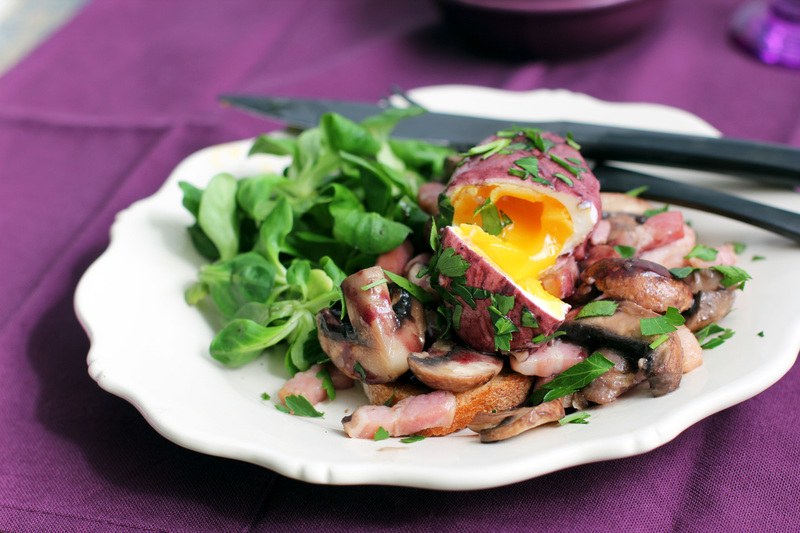 Share a recipe of eggs poached in red wine with lardons and mushrooms served over croûtes and then explain the origins of a feminine French noun, meurette. Apparently, that slighted the fickle temperaments of the word gods. Meurette derives from the Latin word muriae, muria (brine, salt liquor, pickling), but the earliest known usage in French a matter of debate. Some cite the 15th century, others claim it came into parlance centuries later. Already a cryptic dude. A culinary term, meurette refers to a certain red wine sauce ladled over fish and eggs. Ironically, before the 19th century the use of red wine in French gastronomy was relatively scant. This from the land of such red wine braised classics as coq au vin, boeuf à la bourguignon, and daube d’agneau? No doubt due to regional viniculture, Burgundians were unusually ardent about adding red wine to dishes—enough so that any dish à la bourguignon came to mean “braised with red wine.” Or perhaps the cooks were just carefree sots. Oh!! This sounds amazing!!! I have to try it, so I’ll save the recipe. Thanks for share it!! These are soooo pretty!! Definitely in order for a special celebration! What do they taste like?? Eggs perfectly poached in red wine? And bacon?! France is the place for me!!!!!!! Wow, thanks for the info on “meurette”. The Latin root make sense, “meurette” is relatively close to “salmuera” or brine in Spanish. Have a good week! what a delightful idea…..I’m crazy about eggs but this one is very different, looks delicious! The red wine sauce really makes the eggs special. This is so cool! Like my dad’s favourite brekkie gone French!